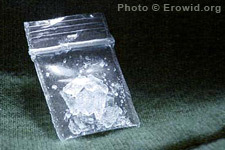 Methamphetamine is a strong physical and mental stimulant available in both prescription and street forms. It is relatively easy to synthesize which has contributed to its widespread use. Methamphetamine: Fact vs. Fiction and Lessons from the Crack Hysteria - Hart, Csete, and Habibi; OpenSocietyFoundation.